I don't know about you but I have a real cookbook problem. I have more than I will ever use. I keep acquiring them. I read many cover to cover, often never cook anything from them (hence The Cookbook Project) and they take up space on my shelves. I have maybe half a dozen I use regularly and the rest I look at then think I should pass them on but somehow I just can't make myself. I Know How To Cook by Ginette Mathiot (trans. Clothilde Dusoulier of Chocolate and Zucchini) is one of those cookbooks I've tried to give away several times but just couldn't. 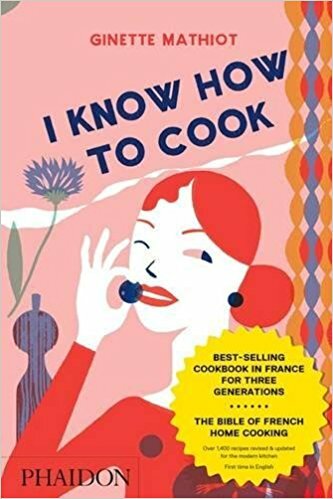 If you haven't heard of it, this book is often called The Joy of Cooking for the French. It's not necessarily the most elaborate cookbook you might find, but it is full of recipes and clear instructions that make it accessible for less-experienced cooks. First published in 1932, it was intended to be a resource for young home makers, to help them feed their families easily and well. Since I am not experienced with French cooking, it seems like a good place to start. Here is where I need to make a confession. I am not only inexperienced with French cooking, I don't know much about the cuisine in general. I've eaten in French restaurants and enjoyed it, but I don't know much about the techniques or history of the cuisine. I am a more informed eater (and cook) of Chinese food. Both Chinese and French cooking are broad categories that cover many different cultures, techniques and histories, I just know more about one than the other. This may be (in part) because Chinese restaurants are generally less expensive than French, so I ate a lot more Chinese growing up but the fact remains: French cooking is one of the world's great cuisines and I know little about it. Knowing this, when I saw I Know How To Cook in the bookstore, I thought it might be a nice way for me to learn more about French Cooking. I bought it at least three years ago. I've leafed through it. Have I cooked a single thing from it? No. That's going to change. Over the next few weeks I'm going to cook and post recipes from I Know How To Cook and hopefully learn a little bit along the way. It should be tasty. Do you know this cookbook and have a favorite recipe? Or do you have specific techniques I might find handy? Please let me know. I look forward to what we will discover together.